Get away from it all by exploring the breathtaking waterfalls, miles of hiking trails, and sheer rock walls that shape the geography of this incredible park. Gorges State Park, located in Western North Carolina about an hour and a half from Asheville, is perhaps best known for being the gateway to some of the area&apos;s most beautiful waterfalls. Here you&apos;ll find a landscape characterized by rugged river gorges and sheer rock walls. The 7,700-acre Park is home to many waterfalls, in large part, because of the high annual rainfall. The more than 90 inches of rain that falls in Gorges State Park each year is enough for this area to be considered a temperate rainforest. Hike to Rainbow Falls and Turtleback Falls: This waterfall hike is the outdoor adventure that draws most visitors to Gorges State Park. While the waterfalls themselves are technically outside the State Park boundary in Pisgah National Forest, the trail head in Gorges is the best way to reach them. Rainbow Falls is the most powerful of the two waterfalls, plunging 150 feet. Turtleback Falls is a popular swimming hole with a natural water slide, especially refreshing in the summer. See the State Park map for more trails at Gorges State Park. Explore the exhibits at the visitor center: The 8,600-square foot visitor center is a great first stop on your exploration of the State Park. Pick up maps and experience the museum-quality exhibits in the environmentally-friendly, LEED Gold certified building. The visitor center has a large parking area, picnic tables and picnic shelters. Picnic in the forest: In addition to picnic tables at the visitor center, there are picnic tables (including some that are wheelchair accessible) throughout the park. Go for a bike ride on the Auger Hole Trail: You can go mountain biking on the Auger Hole Trail between Frozen Creek access and Turkey Pen Gap on the western boundary of the Park. Fish in Bearwallow Creek and Toxaway River: Rainbow trout, brown trout and small mouth bass can all be found in the waters of Gorges State Park. Regulations of the North Carolina Wildlife Resources Commission apply. 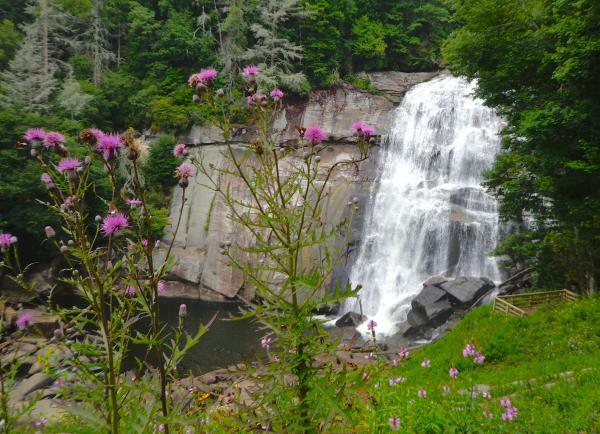 See waterfalls near Gorges State Park: Near Gorges, you&apos;ll find other top area waterfalls including Whitewater Falls, the highest waterfall east of the Rockies (7.2 miles away) and Dry Falls near Highlands, NC (23 miles away). COST: It is free to explore Gorges State Park—there is no admission fee. HOURS: The Park is open 7 days a week from 7 a.m. to 9 p.m. The visitor center is open from 9 a.m. to 5 p.m. daily. ACCESS: The primary access point is the Grassy Ridge access off of NC Highway 281 S. This access point takes you to the Gorges State Park Visitor Center and trail head for Rainbow Falls/Turtleback Falls. Much of the park is remote and accessed by back country trails. TRASH: Gorges State Park is considered "trash free." You must pack out whatever you pack in. WEATHER: Gorges State Park receives more than 90 inches of rain a year. When hiking, have rain gear with you. If you see lightning, get off the trail immediately and seek shelter. From downtown Asheville, take I-240 W to I-26 E. Follow I-26 to Exit 40 for NC-280/Asheville Regional Airport. Follow NC-280 (Boylston Highway) for 20 miles and turn right onto US-64 W toward Sapphire. Follow US-64 W for 17.6 miles before making a left onto NC-281 S near the community of Sapphire. Drive one mile to the signed entrance to Gorges State Park on the left (Grassy Ridge Rd.). In 1916, the dam containing Lake Toxaway, the largest private lake in North Carolina, experienced a failure sending record amounts of water down the river southward. The rushing water destroyed communities in its path and left debris piles of 15-20 feet—some of which still remain today. Many locals sold their land. It was in the 1970s that conservation studies began. By 1982, nearly 275 acres of land (that is currently in the park) was placed on the NC Registry of Natural Heritage Areas. In the 1990s, then-landowner, Duke Energy, offered the land for sale to natural resources agencies in North and South Carolina. Gorges State Park officially opened to the public in 2009.